If you are attending a country show this year look out for the Discovery Barn. This is an education roadshow created by the National Farmers Union (NFU) to try and enthuse youngsters about agriculture and where their food comes from. Thousands of children have already attended the mobile trailer which combines games and fascinating facts for primary school children to learn on their own without teachers or assistance. And with most country and county shows still to take place, that means many more thousands of children have still to enjoy the experience. NFU vice president Guy Smith said: “After inspiring thousands of children with positive messages about agriculture over the past 15 years, we felt it was time to bring our Let’s Talk Farming educational offering bang up to date. 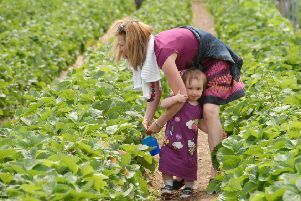 “We enlisted the help of the country’s top experts in education and visitor attractions to develop a fun and interactive experience, aimed to get children excited about food and farming. “The activities have been carefully created to educate children about the realities of farming, such as tractors and technology. The barn will appear at shows, school events and food festivals all across the country including the Countryfile Live Show in Oxfordshire from Thursday August 3 through to Sunday August 6 and the Bucks County Show at Weedon on Thursday August 31. At the barn’s first outing this year, visitors to the Norfolk Agricultural Society’s Spring Fling were very positive about the experience. Charlotte Hornby said: “My daughter was very engaged with the tractor driving and magnetic maze.